Status: Open access on the arXiv. The IceCube Neutrino Observatory, an instrumented cubic kilometer of ice at the South Pole, occupies a unique position at the cross-section of particle physics, astrophysics, and glaciology. Today’s paper demonstrates how IceCube can extend its scope to geophysics and use neutrinos to probe the Earth’s interior using a technique known as neutrino tomography. The neutrino is an exceptionally light, almost massless, and very weakly interacting particle. For this reason it acts as a good cosmic messenger, traveling mostly undisturbed from the astrophysical phenomena that produce it to our detectors. For the same reasons, it is extremely difficult to detect, leading to the massive size and complexity of neutrino detectors like IceCube and ANTARES. While one of the main goals of the IceCube detector was to find neutrinos from astrophysical sources, it is also sensitive to neutrinos from other sources. In this study the authors focus on neutrinos that are produced on the other side of the Earth by the collision of cosmic rays with nuclei in the upper atmosphere. These neutrinos then propagate downwards, through the Earth, and a minuscule fraction are detected by IceCube. Properly describing the propagation of neutrinos through the Earth is the crux of the matter. While there are a variety of characteristics that neutrinos have that one might imagine could effect their propagation through a material (the very weird flavor oscillation among them), the authors argue that the dominant effect for neutrinos of the energy they consider ( > TeV) is absorption by nucleons in the Earth. By analyzing the varying neutrino flux along different lines-of-sight (zenith angle) one can determine the varying density of nucleons and thus reconstruct a density profile of the Earth’s interior. Figure 2 below demonstrates this idea. On the right one can see that there is a lower neutrino flux (fewer detected neutrinos) that are coming straight up (cos(θ)=-1) then from other directions, which is what one would expect given Earth’s dense iron-nickel core. For the purposes of this study, the authors parametrize the Earth as a set of 5 concentric layers, as in Figure 2a. The radii of these layers are strictly defined, but their density is a free parameter. They perform a likelihood analysis to compute the best fit density parameters for the Earth given the full set of IceCube upgoing muon neutrino events, their energy, and flux as a function of zenith angle. 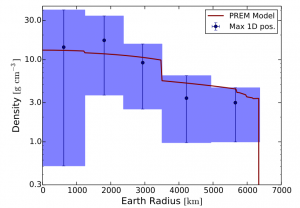 The results are in Figure 3 below, where they compare to the Preliminary Reference Earth Model (PREM), a commonly used earth density model developed via analysis of seismographic data. As can be seen in Figure 3, despite the large uncertainty there is quite good agreement between the best fit results derived from the IceCube neutrinos and the commonly accepted density profile. Moreover one can compute the mass of the Earth from the results of the fit. This yields kg, in good agreement with the best (gravitational) measurement to date of kg. In a fun little aside the authors note here that since this mass measurement depends only on baryonic matter interactions, and not gravitational effects, it also helps to exclude the possibility that some of the matter contributing to Earth’s gravitational field could be dark matter. 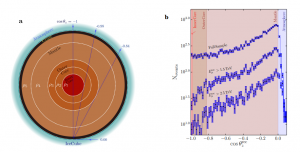 The authors of this paper focus on atmospheric neutrinos for their study. However, in principle, neutrino beamlines, solar neutrinos and (extra-solar) astrophysical neutrinos can also be used to probe the density profile of the Earth with this technique, although certain assumptions about the neutrino propagation would have to be reassessed and properly modeling the flux and spectra of the neutrinos before passing through the Earth can be tricky. A human engineered neutrino beamline gives you the most precise control over this, but also only allows you to probe a single trajectory. Another way to probe the interior of the Earth using neutrinos is by analyzing the geo-neutrino flux, neutrinos produced by the radioactive decay of elements deep inside the Earth, which can be used to study the chemical composition of our planet. While there are large uncertainties in these results, they come from just one year (2011-2012) of IceCube data. The uncertainties are expected to shrink considerably with more data, and the authors model the projected sensitivity, given a larger data set, to Earth’s density profile in the paper. In the future we can look forward to a higher resolution density map of our planet and the possibility that we will be able to determine the location of the core-mantle boundary using neutrino tomography.